What goes on under London? It's a compelling mystery. Londoners are a species inclined to the subterranean, ready to scurry underground at the slightest opportunity. Weretreat beneath the soil for any number of reasons, be it to escape from German bombs, to dance the night away in brick-lined underground cellars or to govern the country in times of danger from vast secret Whitehall complexes. But the first thing that comes to mind when you think 'London underground' is of course the Tube. If London was a human body, the Tube would be its circulatory system, the passengers the red blood cells that keep the city's heart beating. Every Londoner is familiar with how the Tube works, so the notion that there are Tube 'secrets' that only the enlightened know compelling. These range from 'secret' transfer tips to knowing which stations have rivers flowing through them to legends about ghosts haunting platforms. By far the most compelling secrets concern another kind of ghosts, ghost stations. There are a number of these throughout the network, stations closed down as the expected passenger numbers never materialised. 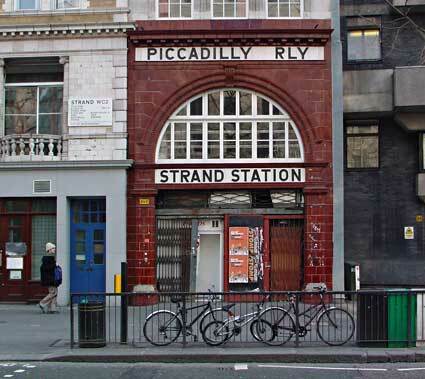 It's one of these that I've visited today: the defunct 'Aldwych' tube station. 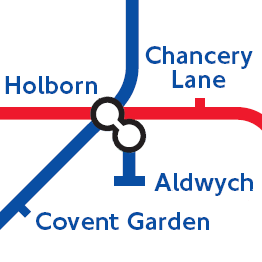 How it appeared on the tube map. Aldwych tube station opened as 'Strand' station on 30th November 1907 and closed down about 87 years later on the 30th of September 1994. It was a Piccadilly Line station, a terminus from a spur that extended southwards from Holborn. I work nearby and regularly walk past the entrance, and although Leslie Green's oxblood bricks still stand out most people seem to pay it little attention. Aldwych does have some notoriety though, mainly as most easily accessible 'ghost' on the network. Beginning in 2010 this opening has become an annual event for the London Transport Museum, and tickets sell out fast. I got mine the moment the online shop opened (and promptly crashed). When we arrive opposite the station we're corralled in a queue and quickly given a health and safety lecture by a Museum employee. Our bags are checked, and after a short wait we're escorted over the road and into the entrance. Ordinarily, this first contact with the 'backstage scenery' of the Tube would be thrilling, but I have actually been to this top part of the station before. In July 2010 they opened up the ticket hall for an exhibition showing off future Tube development plans. I spent a lunch hour down there poking about. It's changed little since then. It's the little flourishes I enjoy in these old places. The way the ticket counter has aged is somehow church like, as are the confession booth like telephone stands opposite it. Churchy. You can see coin scratches on the counter here. Everyone in the group seems nicely curious and attentive. I even spot one particularly intrepid man entering the women's bathroom clutching his camera, no doubt in search of some snazzy 1900s interior decoration. After a quick run down of the station's history we begin our trek down the winding staircase that leads us to the platforms. There are 160 stairs down, and it's easy to get a bit dizzy as you wind your way around. Upon reaching the bottom we see the cavernous lift shafts. There are three of them, big, dirty, industrial holes in the ground that are wider and rounder than you'd expect. It's these two lifts, now parked at the top of the shaft that are the main reason the station closed. They desperately needed to be renovated, but passenger levels were two low to justify the cost. This raises the question of why there are three lift shafts and only two lifts. The answer? Nobody knows. This, perversely, is a far more satisfying response than some boring technical reason. One of the primary attractions of doing something like this is getting a little taste of mystery. The fact that no-one can remember why tens of thousands of pounds were spent building a huge pointless chasm deep in the centre of the city. If no-one knows why this is here, then what else is there left to be discovered? After we've had a chance to soak up the atmosphere we head off down towards the platforms. These corridors are at once familiar and alien. There are two opposing sensations here. The first is that these passageways are caked in dirt in a way that the working Tube system isn't allowed to get. The paint and plaster peels from the ceiling, there's rusted water stains across the floor and the dark green tiles are dusty. I run my finger along one of them as we pass, and find it coated in the debris of who knows how many years. This dirtiness is opposed by a kind of sterility. There are no adverts on the walls, meaning the lines of the tiles wind on in unbroken lines down the walls. There's a deadness that's unfamiliar on the Tube. A walk down tunnels like this in a working station would be punctuated with the sounds of trains leaving and departing, the footfall and chatter of passengers and announcements of 'Mind the Gap'. Even the atmosphere is still, no slight changes in pressure as trains rush towards and away from the platforms. This austerity continues when we reach the platform. There's a former Northern line train of 1972 stock sitting on the platform. It's been stripped back to the basic metal, all decoration except for tube roundels removed. This stripping back extends to the platform itself. To save money only half the platform was tiled. As you explore it's as if they just gave up halfway through decorating it. It looks fine from a distance, but as you get closer you realise that parts of the wall are just plastic decorations put up to complete an illusion. Given this, it's appropriate that this platform is frequently used as a film set. This place has been Vs lair in 'V for Vendetta', a disaster scene in 'Atonement' and a zombie infested nightmare in '28 Weeks Later'. One famous aspect of abandoned tube stations is that often ancient advertising remains from the moment the station was closed. There are a lot of old adverts on the walls of Aldwych, but many of them are deceptive. This station often plays itself, being the definitive 'abandoned tube station'. So while the walls here are plastered with WW2 era graphic design it's a fiction - they're modern props. It's a great example of how a place can be transformed into what people want it to be rather than what it is. Aldwych only closed in the 90s, yet it's crowbarred into shape as a 1940s time capsule. On the other end of the scale, and something I wasn't expecting to see, was that not only is this station maintaining a fiction of the past, but also the future. There were posters up on the wall advertising things to be released in June 2013! These aren't real, but they do set the scene nicely. We move to the other platform, which is a different story. This is a 'test' platform for London Underground. It's where they experiment to see if tiling looks good, or whether a new type of poster glue works properly. As a result this place is a bit of jumble. The original tiles are crudely hacked from the walls, and garish patches of red and white fill the gaps. The original tiled 'Strand' name is just about visible, poking through these snatches of design from across the network. One section of wall looks a bit like a segment of Tottenham Court Road, another from somewhere on the Central Line. The tube network is famously consistent in its design and branding, so this place really feels like a peek behind the scenes, a look through a sketchbook of what could have been, half thought out ideas that might have been considered 'worth a try'. This platform is where the Elgin Marbles were stored during the war, guarded by squads of men with revolvers. Standing, armed, deep underneath London's streets surrounded by 2,500 year old sculptures must have been one hell of a weird job. These places have sheltered people too, being used as an air-raid shelter during the WW2. 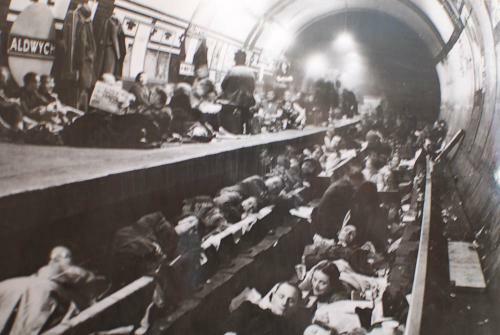 It's difficult to imagine these platforms heaving with thousands of people fitfully sleeping in bunks as bombs thumped distantly overhead. To save you the difficulty of imagining here is a picture. Looks pretty snug. This visit more than lived up my expectations, and Aldwych station is a far weirder place than I'd anticipated. Working tube stations have one role - that of a transport interchange, but Aldwych has many, many different faces to show off. Not many places can pull of being film star, ruinous abandoned wreck, bomb shelter, museum and laboratory. I half wonder what's going to eventually happen to Aldwych. Although unlikely, it's not beyond the realms of possibility that one day it could reopen. Plans were mooted to extend the DLR past Bank taking in City Thameslink, Aldwych and ending at Charing Cross. Looking at it now, it's difficult to imagine this space teeming with passengers. Aldwych feels 'right' as a relic, a frozen gap in the underground fabric of London. A real old advert. Let's see.. Churchill, Dickins, ?? ?, Henry VIII and John Lennon. Any guesses as to who the woman is? Tickets are sold out for this year, but if you're feeling lucky you can turn up on the 2nd, 7th, 8th and 9th of December between 10:30 and 15.00 and in the evenings at 17:45 and 18:45 to see if there's any returns, cancellations or no shows.